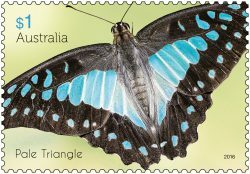 Australia Post’s latest stamp issue celebrates four spectacular Australian butterfly species: the Pale Triangle (Graphium eurypylus), the Bordered Rustic (Cupha prosope), the Cairns Birdwing (Ornithoptera euphorion) and the Chequered Swallowtail (Papilio demoleus). Showcasing bold and striking butterflies, these stamps, says Australia Post Philatelic Manager Michael Zsolt, “remind us of the beauty of the natural world”. 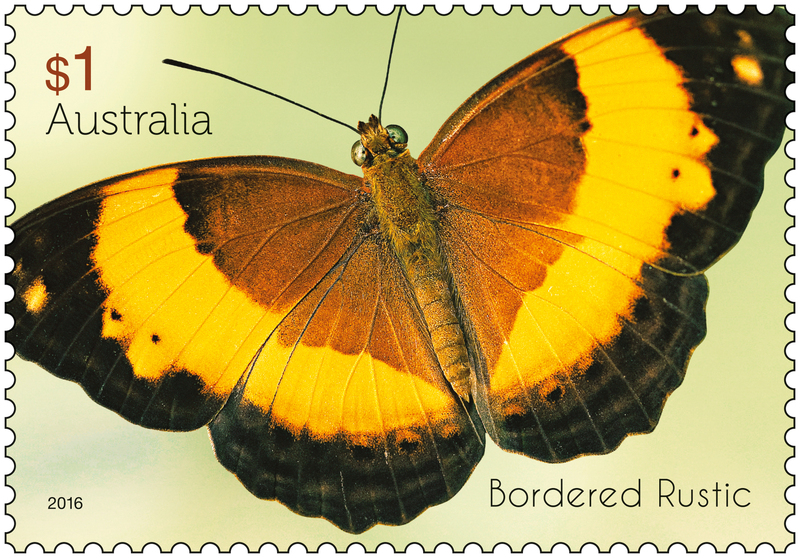 “Australia is home to more than 400 butterfly species. 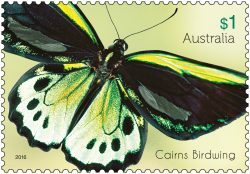 The stamp issue features eye-catching photographs of four bright and beautiful butterfly species”, he said. 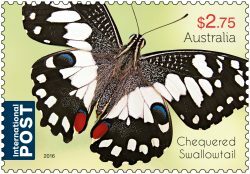 The three domestic base-rate ($1) and one international rate ($2.75) stamps were designed by Sharon Rodziewicz, Australia Post Design Studio. Pale Triangle (Graphium eurypylus) is a large and eye-catching butterfly. The species is part of the Graphium genus of swallowtails, of which only six of the almost 90 species occur in Australia. Bordered Rustic (Cupha prosope) is a medium-sized butterfly. It is seen in sunny areas, small clearings and along creeks, at the edges of thick rainforest in some coastal areas of New South Wales and Queensland. Cairns Birdwing (Ornithoptera euphorion) is boldly coloured and is found only in coastal and montane rainforest areas of northeast Queensland. The female of the species is the largest butterfly found in Australia, with a wingspan of around 15 to 20 centimetres. Chequered Swallowtail (Papilio demoleus) is a large butterfly, found in most parts of mainland Australia as well as on Lord Howe Island. Its larvae feed on a wide variety of Cullen species, groundcover plants or shrubs that occur in the arid and tropical zones of northern Australia. The products associated with this stamp issue are a minisheet, first day cover, stamp pack, sheetlet of five $2.75 stamps, booklet of 20 x $1 self-adhesive stamps, roll of 100 x $1 self-adhesive stamps, postal and numismatic cover and a set of four maxicards. 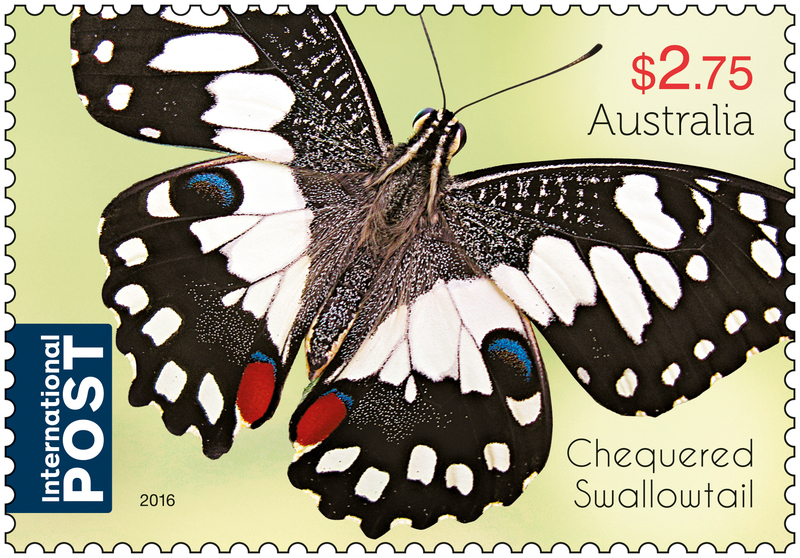 The Beautiful Butterflies stamp issue is available from 3 May 2016 at participating Post Offices, via mail order on 1800 331 794 and online at auspost.com.au/stamps while stocks last. Visit the Australia Post Collectables website australiapostcollectables.com.au for an article on Beautiful Butterflies. The Australia Post Collectables website is a central resource for stamp collectors and philatelic enthusiasts across the globe.